4305 ✉ 3Ia 1 Kr. Rose, plate I, vertical strip of five, fresh colors, left and above touched lightly, otherwise having full to wide margins, partly little Bavarian crackly on not complete cover with closed millwheel postmark \"417\" and additional semicircle cancel \"Rain\", photo expertize Brettl BPP. 4306 ✉ 3Ia 1 Kr. 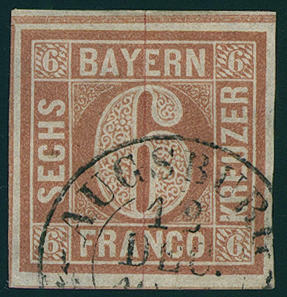 Rose, horizontal strip of three, fresh colors, three sided with wide margins, left to the margin line cut with three clean mounted closed millwheel postmark \"527\" and additional semicircle cancel \"TREUCHTLINGEN 5.8. 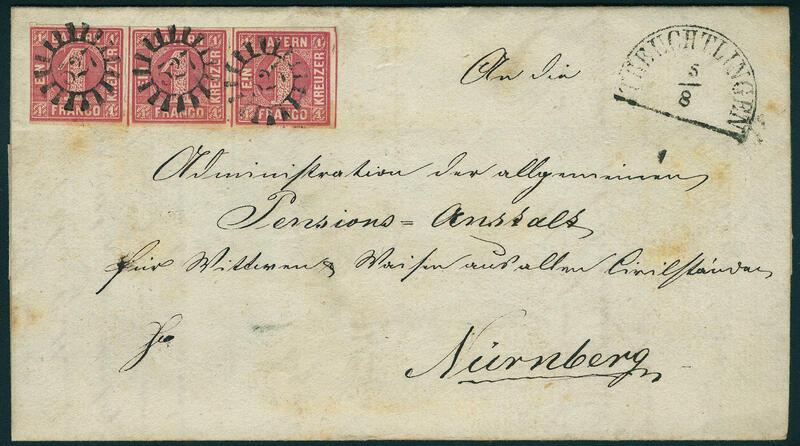 (1860) \" to Nuremberg, slight patina. Michel 550,- €. 4307 ✉ 3Ia 1 Kr. Rose, wonderful fresh colors and with wide margins with parts the intermediate lines on wonderful printed matter (marriage announcement Fritz Baron from Bechtolsheim) with clear rectangle cancel \"Munich 9. 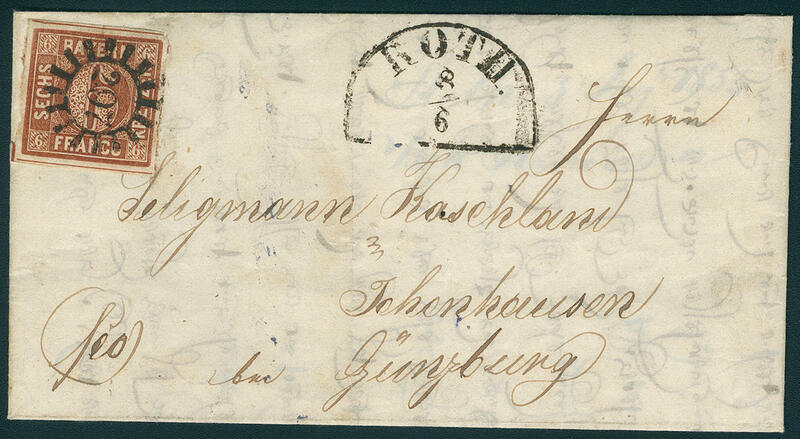 OCT. 1860\" to Ismaning. Outstanding quality! 4308 ✉ 3Ia 1 Kr. 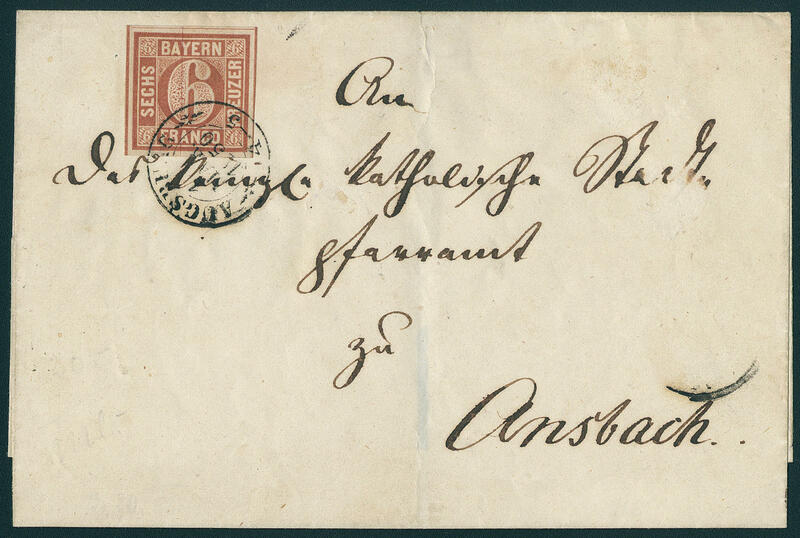 Rose, having bright colors and on all sides piece in outstanding quality with enormous margins with large parts of the cut lines on local letter with two line cancel \"Munich 15. February\". 4309 ⊙ 3II 1 Kr. 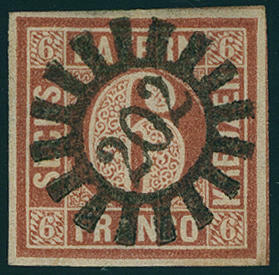 Rose, the scarce plate 2, fresh colors and large margins all around with parts the intermediate lines and clean semicircle cancel \"EDENKOBEN\". A very nice copy this Bavaria rarity! Photo expertize \"faultless condition\" Brettl BPP. 4310 ⊙ 3II 1 Kr. 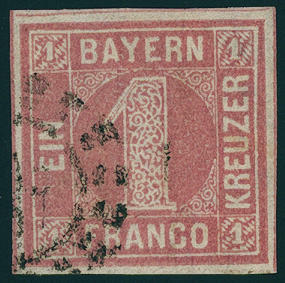 Rose, the scarce plate 2 with tips corners, wonderful fresh colors and large margins all around, neat cancelled an outstanding quality this sought-after Bavaria rarity, the in almost all collections is absent! Photo expertize \"faultless condition\" Schmitt BPP. 4311 ⊙ 4I 6 Kr. Reddish brown, wonderful having bright colors and on all sides piece in outstanding quality with enormous margins with centered, pricked clear closed millwheel postmark \"202 (MARKTSTEFT) \". A piece of dream for the highest standards! Expertized Schmitt BPP. 4312 ⊙ 4I 6 Kr. 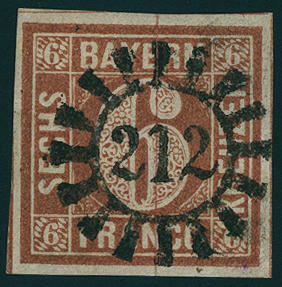 Brown, type I, fresh colors and with wide margins with especially nice centric, straight and clear mounted closed millwheel postmark \"212 (MITTERTEICH) \". An outstanding quality with on of this issue not frequent cancellation. Expertized Pfenniger, Brettl BPP. 4313 ⊙ 4I 6 Kr. 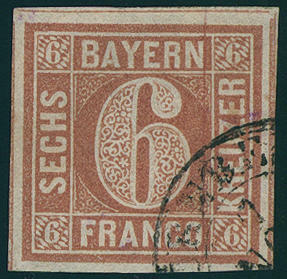 Reddish brown, type I, wonderful fresh colors and on all sides wide to enormous margins with three complete cut lines and clean two ring cancel \"Nuremberg 7. November (1849) \". 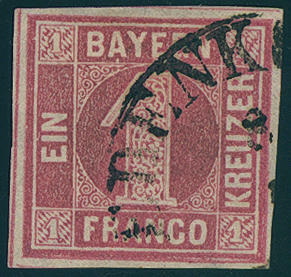 A scarce early use a week to first issue of the stamp. Outstanding quality! Photo expertize Schmitt BPP. 4314 ⊙ 4I 6 Kr. Reddish brown, type I, having bright colors and on all sides piece in outstanding quality with enormous margins with centered closed millwheel cancel \"288\", for the highest standards, photo expertize Stegmüller BPP. 4315 ⊙ 4I 6 Kr. Reddish brown, good type I, having bright colors and on all sides piece in outstanding quality with enormous margins with centered semicircle cancel \"STARNBERG 13 / 12\", expertized Brettl BPP. 4316 ⊙ 4I 6 Kr. 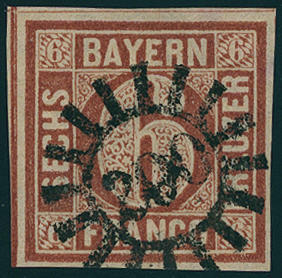 Reddish brown, type I, fresh colors and large margins all around, left above with intermediate lines with closed millwheel postmark \"200\", outstanding quality, expertized Brettl BPP. 4317 ⊙ 4I 6 Kr. 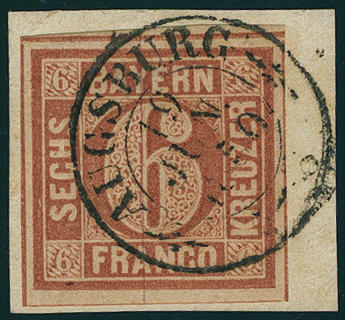 Reddish brown, type I, lightly shade, fresh colors, large margins all around, three sided with intermediate lines and clean mounted two ring cancel \"AUGSBURG\", superb in every respect (choice copy), expertized Brettl BPP. 4318 ⊙ 4I 6 Kr. 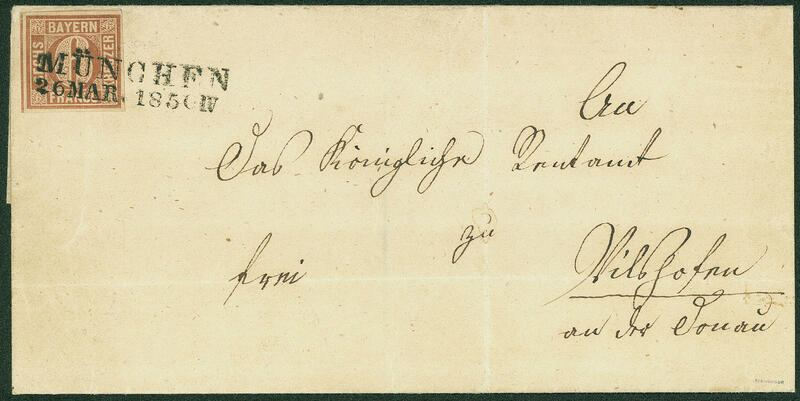 Reddish brown, type I, having bright colors and on all sides piece in outstanding quality with enormous margins with closed millwheel postmark \"145\", expertized Brettl BPP. 4319 ∆ 4I 6 Kr. Brown, the good type I, fresh colors and large margins all around, three sided with going through dividing lines on very nice white letter piece with turning into clear one-line cancel \"CHARGÉ\" in manuscript. 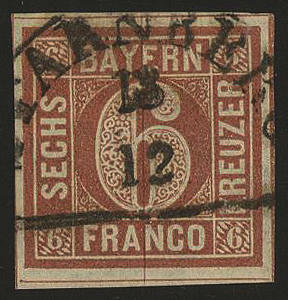 This stamp might not really to the cancellation used become. There are in this kind only a few copies became known, whereby it be herewith about an outstanding quality for the highest standards act! Photo expertize \"a remarkable decorative copy\" Stegmüller BPP. 4320 ∆ 4I 6 Kr. 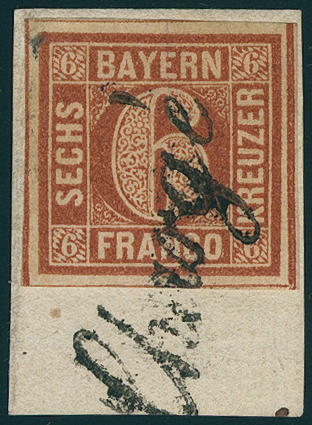 Reddish brown, the scarce type I, fresh colors and on all sides perfect margins, three sided with going through dividing lines on very nice letter piece with scarce thimble cancel \"MARKTL 19 / 3\". An outstanding quality from the home town of the German Pope! Photo expertize Stegmüller BPP. 4321 ∆ 4I 6 Kr. 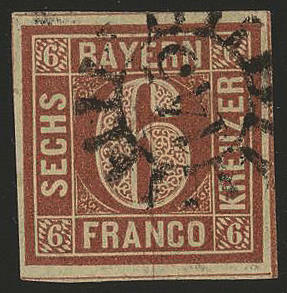 Reddish brown, type I, wonderful having bright colors and on all sides piece in outstanding quality with enormous margins with all four cut lines on magnificent white letter piece with clear two ring cancel \"AUGSBURG 19. January 1850. \"expertized Brettl BPP. 4322 ✉ 4I 6 Kr. Reddish brown, type I, having bright colors outstanding quality, left with full cut line on very nice gef. 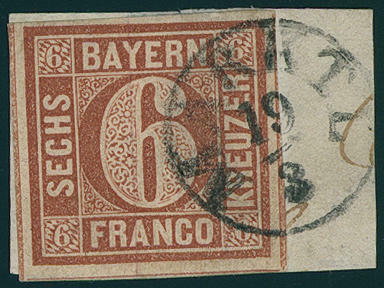 Mint cover with clear two line cancel \"Munich 26. MAR. 1850. \" to Vilshofen. An especially decorative cover this sought-after issue! Photo expertize \"faultless condition\" Schmitt BPP. 4323 ✉ 4I 6 Kr. 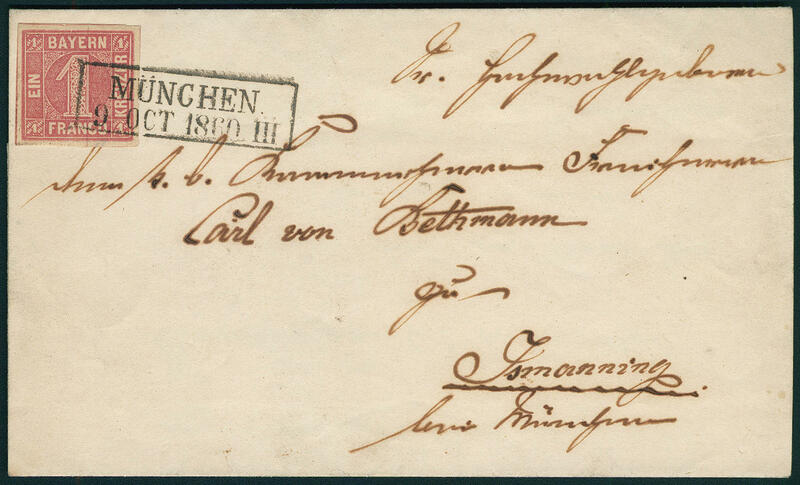 Brown, type I, fresh colors and with wide margins with complete intermediate lines at 3 sides as correctly franked single franking on very nice white cover with clean mounted two ring cancel \"AUGSBURG\" to Ansbach. A very fine example of this rare issue! Photo expertize \"faultless condition\" Brettl BPP. 4324 ✉ 4II 6 Kr. 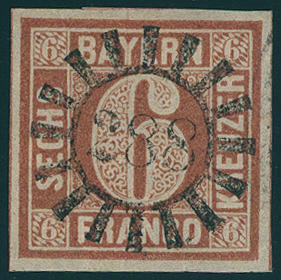 Brown, type II, plate I, fresh colors and large margins all around with very rare advance cancellation through closed millwheel cancel \"297\" with additional HK \"ROTH 8.6. 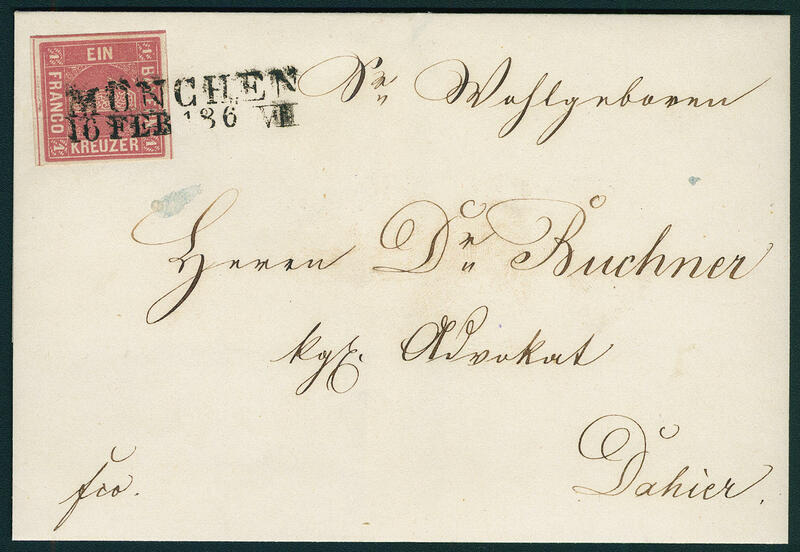 (1855) \" on very nice small-format cover to Ichenhausen with arrival postmark. There are only few advance cancellations from this city have become known, whereby it be here about an especially beautiful document act! Photo expertize Stegmüller BPP.